Project Flying Letters (short: flylttrs) is a text input library for Circle OS. device does have the ability to store information on the non-volatile memory. wincent DOT balin AT gmail DOT com . path ("Include directories" option in the Ride7 IDE). 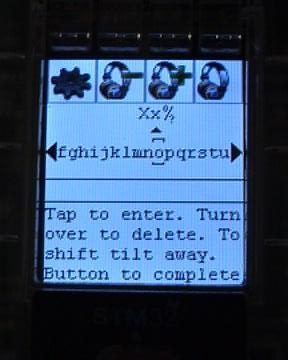 the library stores the orientation of the screen till the end of input. All functions return true to signal end of output and false otherwise. This is the simplest function to call. It shows the output screen first. On the output screen the char array output of the size osize is shown. If the screen is too long, it will be shortened with "..." an the end. away from yourself to change the register. the character row. To delete the last character turn over the device. Below you see the abbreviated form of the instructions described above. The input line is stored in the char array input with size isize. The length of the input in characters can not go over max_isize. "Correct errors". Press the button to confirm your input. it behaves just like the first function. is featured in the description of the first function. Execute this command in the folder where Eliza.lib resides. Remember that the object file flylttrs.o was compiled for Circle OS 3.71. If you have any problems with Flying Letters, try to recompile flylttrs.o. where flylttrs.h resides to the "Include directories" entry in the Ride7 IDE.